For some reason in today's world, we tend to make evil something abstract. No one wants to believe in Hell. No one wants to believe in Satan. People in today's world try to say that biblical references of the Devil are just attempts to personify the wrong that occur in the world. 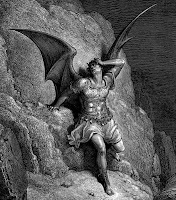 Isn't ironic that Satan, who was top amongst all the angels and who fell because of his pride, probably likes slipping in under the radar. He knows that when we don't believe that he exists it actually makes it easier for him to make himself more present. It makes it easier for him to attack us. I don't think that any police officer, except for maybe Sheriff Andy Taylor and Deputy Barney Fife of the Andy Griffith Show, would say that there is not evil in the world, although some might still debate about the reality of Satan. As someone who has sat outside of houses with butchered families inside, rolled up on scenes of homicides where an innocent girl was murdered for gas money, or been present when automatic gun fire has erupted in a crowd, I am here to tell you that Satan is real and present in our world. No human could unleash the evil that is present without demonic assistance. The devil is not only present in the Hitler's, the Manson's or the murderers of the world though. He attacks each and every one of us every day and wins quite often. The devil's goal is to claim as many souls as he can. Every time he causes us to sin he causes us to become more and more separated from God. The further from God we go the easier it is for us to sin and the cycle begins again. It would be a very gloomy picture if it were not for the good news that been given to us. And that good news is that God became incarnate and became the perfect sacrifice for us. It is because of this perfect sacrifice that we have the possibility of eternal life. It is because of God's mercy that we have the fount of God's grace available to us in the Eucharist and his forgiveness available to us in the sacrament of reconciliation. We are warned in scripture to keep guard. Paul tells us to put on the armour of God so that we are able to stand firm against the tactics of the Devil (Eph 6:11) To do this we must partake in the sacraments. We must go be reconciled for our sins. We must receive His grace through the Eucharist. We must pray daily. Whatever your vice is, ask God for the opposing virtue to battle it. Do not belittle evil. Don't toy with the Devil and play silly little games. Do not be afraid either because if God is for us then who can be against us. (Rom 8: 31) HA!!! Two bible verses in one blog!! Pretty good for a Catholic huh?? ?